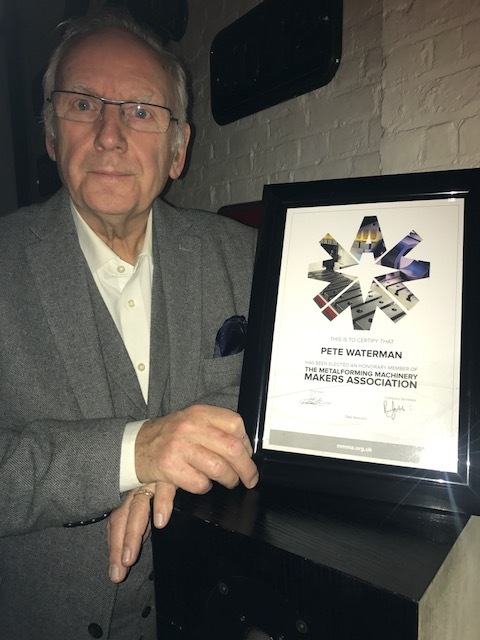 The MMMA are very pleased to announce that Pete Waterman OBE has become an Honorary member of the Association. This follows on from the after- dinner speech Pete gave on the evening of the MMMA – ISME, Gold Medal Awards night in May 2018. Pete was on his feet for over an hour, speaking about his hugely successful Music career and giving a very interesting and passionate talk, regarding his enthusiasm for Engineering and training of younger people within the industry. So much so, that in 2013 the Government invited him to sit on its HS2 growth taskforce which was challenged to identify and promote opportunities that would provide economic development and other benefits from this major project. Railways also provide a life- long passion for Pete. Having an encyclopaedic knowledge of the UK rail industry. Pete built from scratch two successful business and in the process created hundreds of jobs in Crewe. The preservation of steam locomotives is close to his heart, in order to educate and entertain future generations. Pete was Awarded an OBE in the 2005 Queens New years Honours list for his services to the music industry. Today he devotes a large amount of his time to public service, which include, a director on the Cheshire & Warrington Local Enterprise Partnership and as Patron of the National Skills Academy for Railway Training.